Full of fine features to contribute to a smooth work session at your desk, the Amish 50" Executive Roll Top Desk uncovers surprise functions at every level. Featuring the old fashioned style of a roll top desk, this solid wood office furniture curves gracefully as it works hard for you. With a lovely pull down tambour top, it's easy to conceal any clutter or work in progress. All the compartments, cubbies, drawers, slots and built in style contribute to making this solid wood desk a favorite for your home office or business office. Select the wood and stain for your roll top desk. You can choose to add a raised panel back that allows you to position your desk anywhere in the office. Select from a collection of fine hardware and add drawer locks if you wish. A classic roll top desk like this provides a place for everything while it supports any writing, reading, correspondence or laptop activity you need to accomplish. 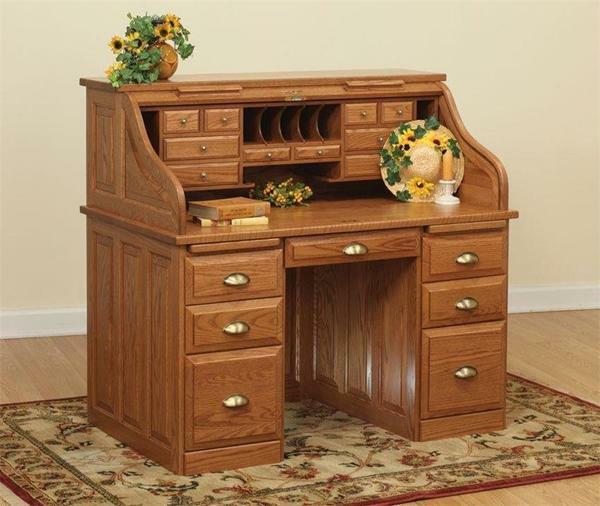 Browse more of our Amish Roll Top Desks to see all the variety we have to offer. Hi Valerie - We just wanted to tell your company how pleased we were with the roll-top desk. We had never purchased such an expensive item on the internet, so it was with great reservation that we placed an order based on pictures and promises. We hope that you will tell the craftsman what a beautiful desk he created from the details on the side panels to the well-fitted drawers. The finish is also exceptional. My husband began our cabin five summers ago and the desk completely exceeded his expectations. When there was an unforeseen problem in delivery, it was solved to our satisfaction. Thank you,Nina & Bill A. (Item 7959) Amish Executive Roll Top Desk 50"